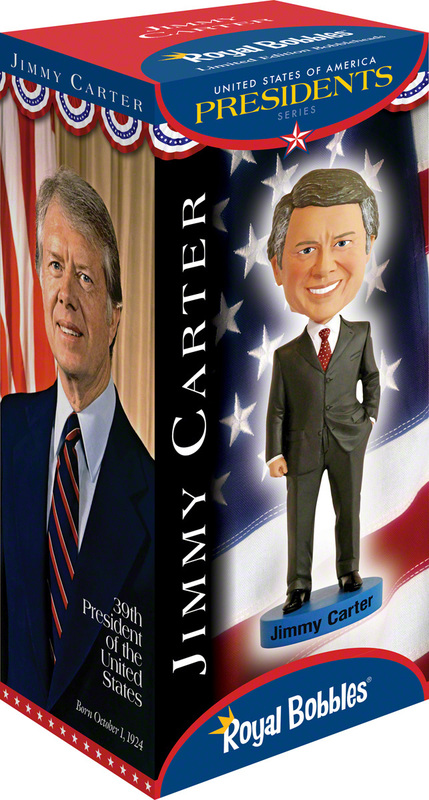 This is the v2 update to the Royal Bobbles Jimmy Carter bobblehead. The head has been completely resculpted, and this version features an entirely new body. James Earl “Jimmy” Carter, Jr. was the 39th President of the United States. He promised a government “as competent, as compassionate, as good” as the American people. Carter became what many have called “the best former president in history” for work through his Carter Center in Atlanta on conflict resolution, the supervision of democratic elections abroad and the worldwide fight against the disease. Before becoming President, Carter graduated from the United States Naval Academy, served as a U.S. Naval officer for seven years, ran his family peanut farming business, served two terms as a Georgia State Senator and was elected the 76th Governor of Georgia in 1971.